Keep your CD collection neatly organized and easy to navigate with these modern black metal mesh storage boxes. Designed specifically for CDs, these bins keep CDs oriented with the spine labels facing the open side, so it's easy to look through a collection to find a specific album. The design allows bins to be organized on shelves or in entertainment centers. Cutout handles make it easy to move full bins while enjoying albums in different areas of the home. 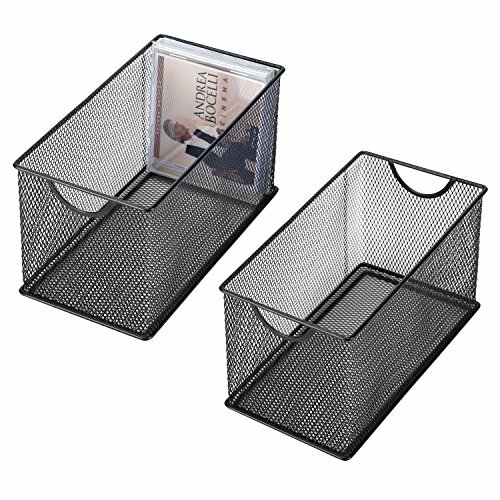 Organize your music with functional modern flair in these sleek black mesh CD bins. Approximate Dimensions (each bin, in inches): 6.1 H × 5.5 W × 10.6 L.
Set of 2 black metal mesh CD storage boxes with 24-CD capacity. Sleek design in black metal mesh with a durable metal frame and easy access semicircle cut-out handle. Cases are specifically designed to hold CDs; each case can hold 24 CDs in standard jewel cases (CDs not included).